Coming soon...expanded coverage of this episode. Let me shake your hand, friend. When rising-star Senator William Dennis comes aboard Seaview to view the results of Nelson's new X-4 submarine tracking device, he makes a point of shaking the hand of every man on board, as politicians will do. Kowalski soon experiences the first of what will be for Seaview's crew, a bizarre series of events, including the sighting of strange creatures of various sorts and the apparent disappearance of every submarine from the world's oceans -- all the lights on Nelson's read-out board blink out one by one until only Seaview is left. Then, her indicator light disappears as well. Kowalski's encounter with first sighted oddity in "Day the World Ended." He inadvertently shoots best buddy Patterson. Nelson is unable to reestablish contact with Naval Command. 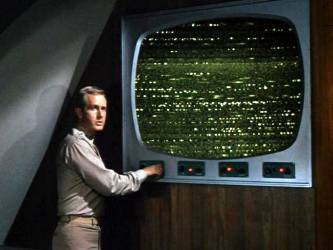 All radio and television signals cease. There are no signs of life anywhere. No birds in the air, no ships on the sea, no airplane traffic--nothing. 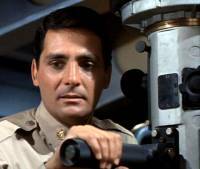 Amid a sense of dread, Nelson and Sharkey take off with Senator Dennis in the Flying Sub to try to find out what's going on, and Seaview heads North. FS-1 stops in Washington to find it deserted, then, although Senator Dennis is adamant about needing to get back to Seaview, Nelson wants one more stop -- they head north to New York. Crane begins to wonder where north is, particularly when he surfaces and sights San Francisco's Bay Bridge through one of Seaview's periscopes. Problem is, he's in the Atlantic Ocean off the coast of Virginia, not in the Pacific. 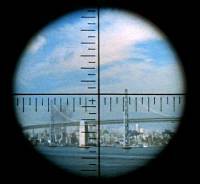 A shocked Morton confirms the sighting, but satellite data eventually belies what they see, and Seaview continues north for a rendezvous with Nelson at the United Nations Building. Crane experiences an encounter with the same monster Kowalski saw and eventually concludes that the X-4 is giving off some kind of emission which is affecting their minds. He orders the X-4 dismantled. Doc Reports to Crane that the recuperating Patterson claims to be listening to radio broadcasts on a small portable, in spite of the fact that no one else can hear them. 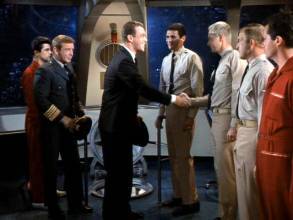 When Patterson reveals he never shook hands with Senator Dennis, and in fact must have been the only one on the boat who didn't, the pieces fall into place, and Crane orders the X-4 reassembled. Coming ashore in Manhattan, Nelson, Sharkey and Senator Dennis again find a deserted City. Dennis is anxious to get back to Seaview, but Nelson wants to see more. Dennis disappears in frustration, apparently headed back to the Flying Sub. Nelson, Sharkey and Senator Dennis find Manhattan desolate and silent. Eerie hints of life filter through when Nelson and Sharkey approach a theater and hear applause. 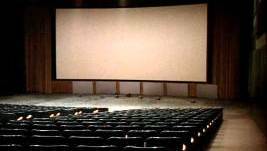 Yet, when they enter the theater, they find no one. They are both suddenly eager to get back to the Flying Sub, but Dennis is nowhere to be found. 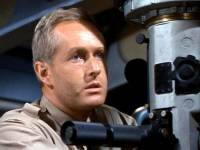 Back on FS-1, Sharkey immediately notices a jerry-rigged explosive charge and Dennis comes flying out of a storage cupboard, gun in hand. Nelson realizes the truth: it is Dennis who has been responsible for the odd happenings all along -- as Nelson puts it, through some kind of mass-hypnosis -- Dennis' objective, to steal the X-4 in a grab for world power. A smiling Dennis pleads guilty as charged and proceeds to knock Sharkey out. A struggle between Nelson and Dennis ensues and the Senator is mortally wounded, smiling no longer. As he dies, his power over Nelson and the others dies with him. Nelson realizes they are once again free. Mark Says: My favorite year-three episode. An intriguing mystery buoyed by the perfect casting of Skip Homeier as The Senator. 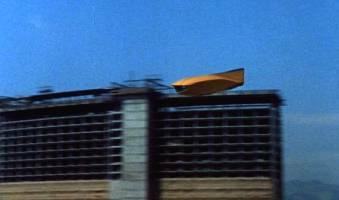 The special effects are also first-rate, including the flying sub soaring through the sky, skimming and landing on the ocean surface and a spectacular shot of it flying over a couple of buildings. Exciting and involving, this is a genuine third season classic. 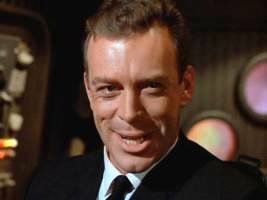 Mike Says: In spite of an ending that could have been much better explained, this is one of the eeriest of all of Voyage's 110 outings and stands out as a classic. Events pile one on top of another until it feels as if you're cut off from the rest of the world. Indeed, as far as civilization goes, there apparently IS no rest of the world. The location shooting and fabulous footage of the Flying Sub are edited into the show at an exciting pace. 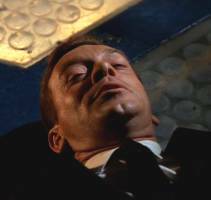 Del Monroe turns in a standout performance as Kowalski, tortured by the knowledge he has almost killed Patterson. Writing makes the difference. Tight direction, editing and great overall production values make this an unlikely candidate to have been part of year three -- proof once again that Voyage always had the talent on board. If only there had been more decent scripts like the one for "The Day The World Ended."